The trial of 12 Catalan pro-independence leaders involved in a bid to secede from Spain will start on 7 or 12 February, Supreme Court president Carlos Lesmes has said. Lesmes was speaking to reporters in a briefing before the long-anticipated trial just as nine of the accused were being transferred from the northeastern region of Catalonia to prisons near Madrid. In pre-trial detention for months, they have been charged with rebellion for their role in a dramatic attempt to break from Spain in October 2017. Three others will also stand trial, accused of disobedience and misuse of public funds. After having left their prisons in Catalonia in police vans when it was still dark, the nine were gathered together at another jail near Barcelona. 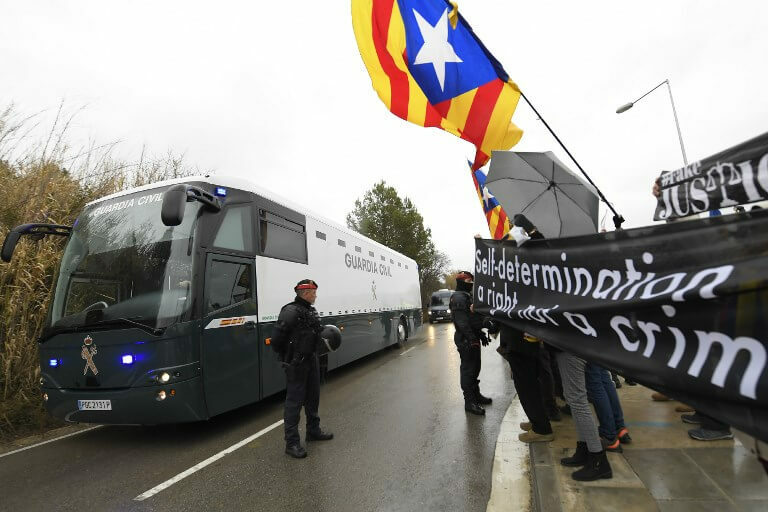 They left again in a Guardia Civil police bus for Madrid, with supporters outside cheering them on, waving the region’s red, yellow and blue independence flag. The official start date of the trial could be announced on Friday or Monday. It is divisive – a ‘farce’ for independence supporters in Catalonia but necessary for many Spaniards who looked on in disbelief as the rich region’s then executive tried to secede. Among notable absentees will be Carles Puigdemont, Catalonia’s former president who left for Belgium days after the Catalan parliament made a short-lived declaration of independence on 27 October 2017. Spain does not try suspects in absentia. As such, the trial’s main protagonist is former regional vice president Oriol Junqueras who opted to remain in Spain and faces up to 25 years in jail on charges of rebellion and misuse of public funds.